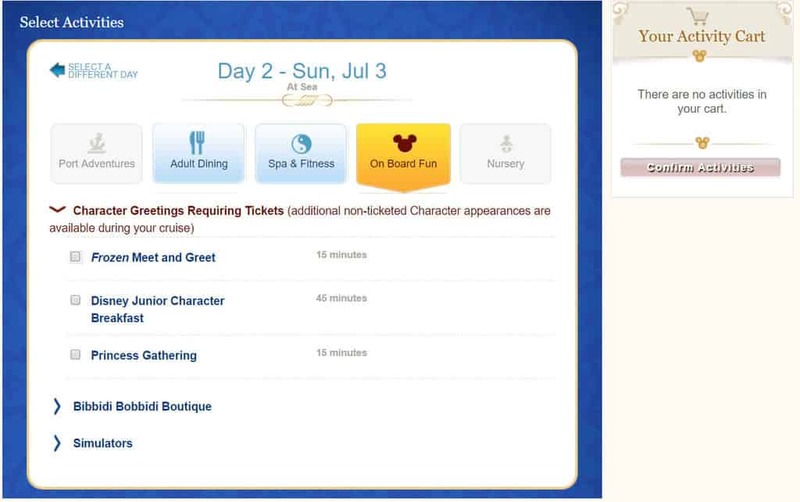 On my recent post explaining all the character meets that were offered on my 7 Day Disney Fantasy Eastbound cruise, many people asked how they can book the Frozen meet, Princess meet and Disney Jr Breakfast online. Here’s a step-by-step demonstration how to book these free activities. After completing all your online check-in documents, you’ll have access to your Cruise Activities calendar which allows you to book your excursions, Palo & Remy dining and special character meets that require tickets. 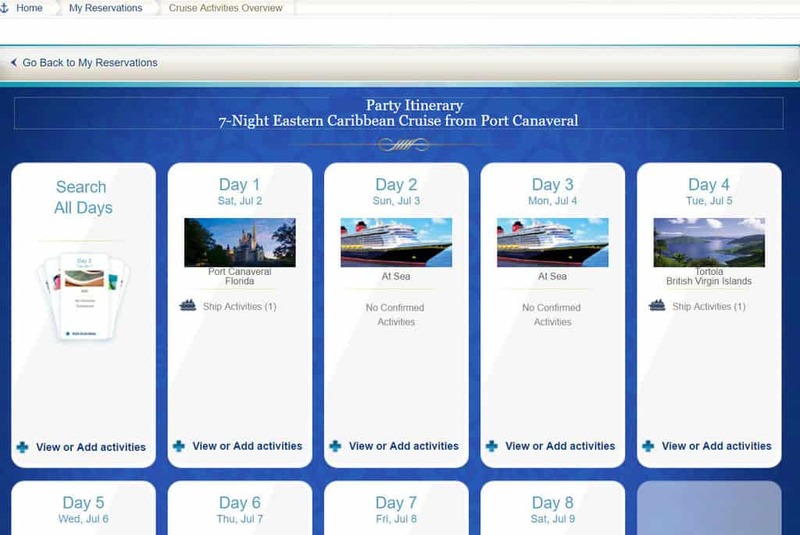 Visit “My Disney Cruise” then click on “My Cruise Activities” to reach this screen on your desktop. First you’ll want to click on “View or Add Activities” at the bottom of your desired date. 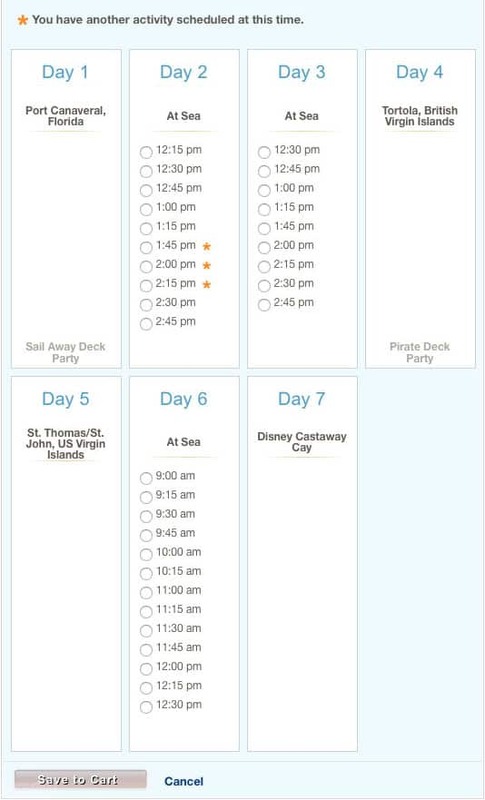 For this example I chose Day 2 and then “On Board Fun.” It was an At Sea day, so Port Adventures is darkened out and I don’t have a small child with me, so nursery is also unavailable for my room. 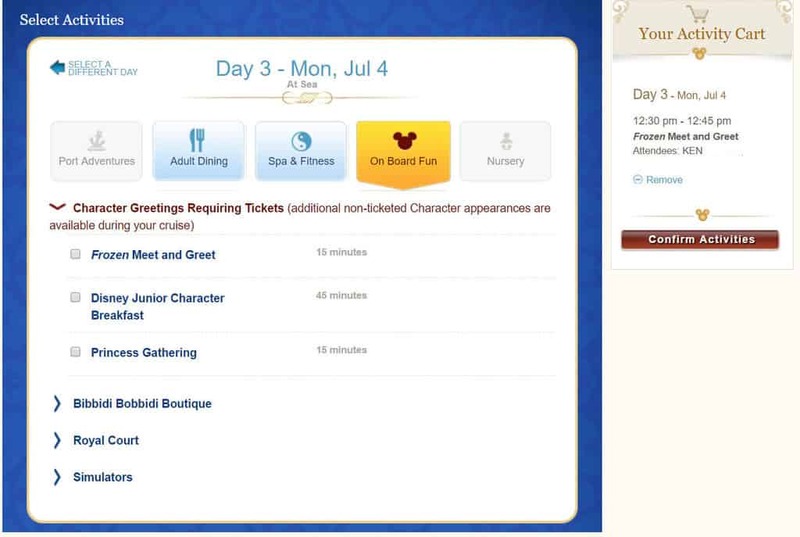 “Search All Days” is a great feature for the meet and greets and character breakfast! 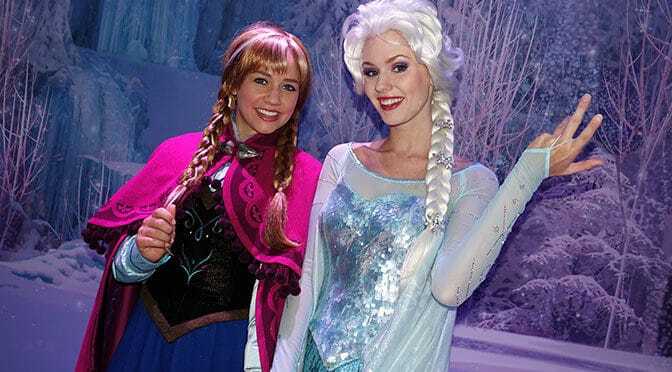 The most popular ticket is the Frozen Meet and Greet, so find a date and time that suits you. Click the little box beside Frozen Meet and Greet and you’ll be given a chance to choose who will attend. You’ll be able to select which persons from your room desire to attend each activity. You can book 1 or up to everyone in your room. You’ll then click a button that will appear at the bottom that says “Check Availability.” It will present you with a series of times that could be available. If you choose to Search All Days, you’ll see a view that looks more like this. Click a time you’d like, then click “Save to Cart.” Remember, there is no charge for these meet and greets. This part proved a little tricky to me because it would show me available times for the meet, but when I chose one, it just kept giving me an error. I had to search through multiple dates to find one that actually worked. The activity is then confirmed on this screen. You can choose “Add More Activities” to continue with the process in booking the meets and Port Excursions. This pre-booking option saves the guest a great deal of time and stress of visiting Guest Services once you arrive on the ship. If you are unable to find a time for any of these activities, do stop by and check as there could be more times available. This meet usually includes a meet with Anna and Elsa in Animator’s Palate at a pre-arranged time. It is the only way to meet them on board the Disney Fantasy. This meet usually includes a meet with Tiana, Belle, Ariel and Cinderella in the Atrium on Deck 3. They can be met at other times on the ship with separate meet and greets and different backdrops. 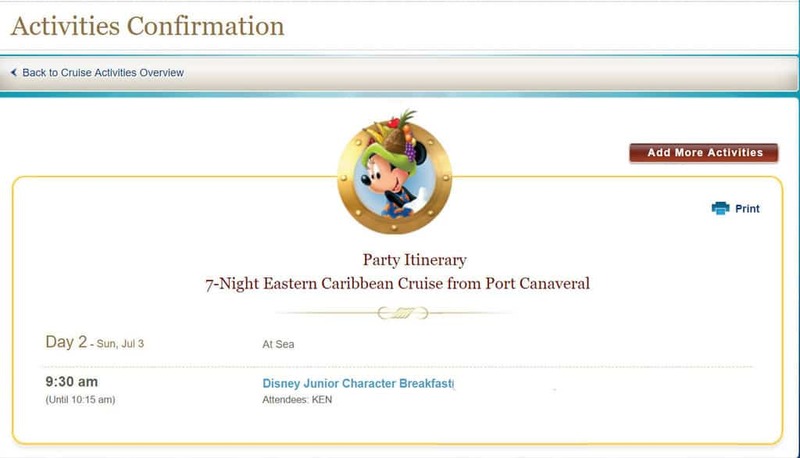 Character Breakfasts are only available for 7 night or longer sailings with at least 2 days At Sea. The Disney Jr Breakfast provides you with a meet with Jake, Sofia, Doc and Mickey Mouse. It is held inside Animator’s Palate. If you are doing a 3 or 4 night cruise, expect these meets to be taken up quickly, so book them as soon as you can check in online! Included, but reserve in advance! Can you book meet and greet plans for others in your travel party if your reservations are linked or can you only book for the people in your room? Yes, if you are linked, you can book together. Hi Kenny- do you need to check in online first before booking activities? I was told you can check in online at anytime by a web support phone operator. What is order of operation for booking activities?? Thanks! Love your site and insight ! I had to do online check-in before booking any activity. This guide explains step by step how I booked the meets. It’s the same procedure for other activities. Kenny! You are amazing and now have me wanting to book a Disney cruise asap! Thanks for the tips and for being such a great resource.